Anyone who follows music press would agree that Brooklyn has been a hotbed of indie creativity during the past decade. The styles run the gamut from freak-folk to experimental noise, to sugarcoated pop, to singer-songwriter confessionals, to good old fashioned rock and roll. From this creative vortex emerge the duo Christy and Emily with a sound that is a pastiche of all of the above. Christy Edwards and Emily Manzo have created a sweetly drone-y and sharply melodic record with Superstition. The vocal harmonies are pitch perfect and the songwriting, which could be classified as quietly psychedelic, is well developed. The songs, like fog, seem to creep in with plenty of reverb and quietly distorted guitar. On the title track and the lovely “Nightingale,” the mellow haze clears enough to reveal classic folk melodies. On others, such as “105 & Rising,” the buzzing thump of layered guitars and improvised instruments becomes distinctly sinister. The album’s closing track, “Tigers,” showcases the band at their more upbeat and successfully invokes folk rock vocal patterns. The track also features guest drums by Brooklyn drone master Oneida’s drummer, Kid Millions. 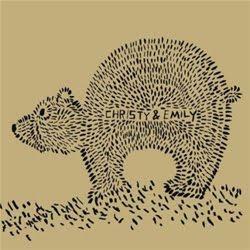 The world of Christy & Emily is layered and ethereal. Trying to pin them to one sound is difficult and, ultimately, fruitless. Those grasping for a comparison might point to Damon and Naomi, or perhaps Coco Rosie without the trust fund and fake, white girl rap. As its title implies, Superstition is best captured by an emotion. It is dreaming, reaching, and searching for a feeling that could be a false lead, but could a new revelation and understanding, for better or worse. The reverb drenched guitar and sunny to stormy vocals enable listeners to stretch and reach to touch with their finger tips—but not quite grasp—one strong feeling.